Liczba stron: 203 Jest to ujednolicona liczba stron, która ułatwi Ci porównanie długości książek. Każda strona Legimi to 200 słów. Awesome occult western adventure, from the master of strange fiction, Robert E. Howard! 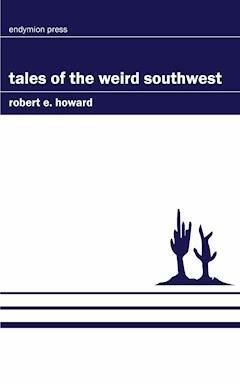 Truly one of the greatest contributions to the development of the Weird Fiction genre, Robert E. Howard's Tales of the Weird Southwest is a treasure for any collection! STEVE BRILL did not believe in ghosts or demons. Juan Lopez did. But neither the caution of the one nor the sturdy skepticism of the other was shield against the horror that fell upon them—the horror forgotten by men for more than three hundred years—a screaming fear monstrously resurrected from the black lost ages. Yet as Steve Brill sat on his sagging stoop that last evening, his thoughts were as far from uncanny menaces as the thoughts of man can be. His ruminations were bitter but materialistic. He surveyed his farmland and he swore. Brill was tall, rangy and tough as boot-leather—true son of the iron-bodied pioneers who wrenched West Texas from the wilderness. He was browned by the sun and strong as a longhorned steer. His lean legs and the boots on them showed his cowboy instincts, and now he cursed himself that he had ever climbed off the hurricane deck of his crankeyed mustang and turned to farming. He was no farmer, the young puncher admitted profanely. Yet his failure had not all been his fault. Plentiful rain in the winter —so rare in West Texas—had given promise of good crops. But as usual, things had happened. A late blizzard had destroyed all the budding fruit. The grain which had looked so promising was ripped to shreds and battered into the ground by terrific hailstorms just as it was turning yellow. A period of intense dryness, followed by another hailstorm, finished the corn. Then the cotton, which had somehow struggled through, fell before a swarm of grasshoppers which stripped Brill’s field almost overnight. So Brill sat and swore that he would not renew his lease—he gave fervent thanks that he did not own the land on which he had wasted his sweat, and that there were still broad rolling ranges to the West where a strong young man could make his living riding and roping. Now as Brill sat glumly, he was aware of the approaching form of his nearest neighbor, Juan Lopez, a taciturn old Mexican who lived in a but just out of sight over the hill across the creek, and grubbed for a living. At present he was clearing a strip of land on an adjoining farm, and in returning to his but he crossed a corner of Brill’s pasture. Brill idly watched him climb through the barbed-wire fence and trudge along the path he had worn in the short dry grass. He had been working at his present job for over a month now, chopping down tough gnarly mesquite trees and digging up their incredibly long roots, and Brill knew that he always followed the same path home. And watching, Brill noted him swerving far aside, seemingly to avoid a low rounded hillock which jutted above the level of the pasture. Lopez went far around this knoll and Brill remembered that the old Mexican always circled it at a distance. And another thing came into Brill’s idle mind —Lopez always increased his gait when he was passing the knoll, and he always managed to get by it before sundown—yet Mexican laborers generally worked from the first light of dawn to the last glint of twilight, especially at these grubbing jobs, when they were paid by the acre and not by the day. Brill’s curiosity was aroused. He rose, and sauntering down the slight slope on the crown of which his shack sat, hailed the plodding Mexican. Lopez halted; looked about, and remained motionless but unenthusiastic as the white man approached. “No Babe,” grunted Lopez shortly. Brill could speak Spanish himself and read it, too, but like most Anglo- Saxons he much preferred to speak his own language. Brill knew that the illiterate Mexicans looked with superstitious aversion on the mounds that are found here and there through the Southwest —relics of a past and forgotten age, containing the moldering bones of chiefs and warriors of a lost race. “Best not to disturb what is hidden in the earth,” grunted Lopez. Brill turned to glance at his rail-fenced corral, inhabited now by his saddlehorse, a pair of workhorses and a scrawny cow. “How come you know so much about it?” he asked curiously. Brill nodded abstractedly, hardly heeding. Of all the continent of North America there is no section so haunted by tales of lost or hidden treasure as is the Southwest. Uncounted wealth passed back and forth over the hills and plains of Texas and New Mexico in the old days when Spain owned the gold and silver mines of the New World and controlled the rich fur trade of the West, and echoes of that wealth linger on in tales of golden caches. Some such vagrant dream, born of failure and pressing poverty, rose in Brill’s mind. The effect of that simple statement on Lopez was nothing short of shocking. He recoiled and his swarthy brown face went ashy; his black eyes flared and he threw up his arms in a gesture of intense expostulation. “Told you what?” asked Brill. Lopez lapsed into sullen silence. Lopez started, stared, and to Steve’s surprise, caught at the suggestion. “I will! Dios be thanked the good priest taught me to write when I was a child. My oath said nothing of writing. I only swore not to speak. I will write out the whole thing for you, if you will swear not to speak of it afterward, and to destroy the paper as soon as you have read it. “Sure,” said Brill, to humor him, and the old Mexican seemed much relieved. And Lopez hurried along his homeward path, his stooped shoulders swaying with the effort of his unwonted haste. Steve grinned after him, shrugged his shoulders and turned back toward his own shack. Then he halted, gazing back at the low rounded mound with its grass-grown sides. It must be an Indian tomb, he decided, what with its symmetry and its similarity to other Indian mounds he had seen. He scowled as he tried to figure out the seeming connection between the mysterious knoll and the martial ancestor of Juan Lopez. Brill gazed after the receding figure of the old Mexican. A shallow valley, cut by a half-dry creek, bordered with trees and underbrush, lay between Brill’s pasture and the low sloping hill beyond which lay Lopez’s shack. Among the trees along the creek bank the old Mexican was disappearing. And Brill came to a sudden decision. Hurrying up the slight slope, he took a pick and a shovel from the tool shed built onto the back of his shack. The sun had not yet set and Brill believed he could open the mound deep enough to determine its nature before dark. If not, he could work by lantern light. Steve, like most of his breed, lived mostly by impulse, and his present urge was to tear into that mysterious hillock and find what, if anything, was concealed therein. The thought of treasure came again to his mind, piqued by the evasive attitude of Lopez. What if, after all, that grassy heap of brown earth hid riches—virgin ore from forgotten mines, or the minted coinage of old Spain? Was it not possible that the musketeers of de Estrada had themselves reared that pile above a treasure they could not bear away, molding it in the likeness of an Indian mound to fool seekers? Did old Lopez know that? It would not be strange if, knowing of treasure there, the old Mexican refrained from disturbing it. Ridden with grisly superstitious fears, he might well live out a life of barren toil rather than risk the wrath of lurking ghosts or devils—for the Mexicans say that hidden gold is always accursed, and surely there was supposed to be some especial doom resting on this mound. Well, Brill meditated, Latin-Indian devils had no terrors for the Anglo-Saxon, tormented by the demons of drouth and storm and crop failure. Steve set to work with the savage energy characteristic of his breed. The task was no light one; the soil, baked by the fierce sun, was iron-hard, and mixed with rocks and pebbles. Brill sweated profusely and grunted with his efforts, but the fire of the treasure-hunter was on him. He shook the sweat out of his eyes and drove in the pick with mighty strokes that ripped and crumbled the close-packed dirt. The sun went down, and in the long dreamy summer twilight he worked on, almost oblivious of time or space. He began to be convinced that the mound was a genuine Indian tomb, as he found traces of charcoal in the soil. The ancient people which reared these sepulchers had kept fires burning upon them for days, at some point in the building. All the mounds Steve had ever opened had contained a solid stratum of charcoal a short distance below the surface: But the charcoal traces he found now were scattered about through the soil. His idea of a Spanish-built treasure trove faded, but he persisted. Who knows? Perhaps that strange folk men now called Mound-Builders had treasure of their own which they laid away with the dead. Then Steve yelped in exultation as his pick rang on a bit of metal. He snatched it up and held it close to his eyes, straining in the waning, light. It was caked and corroded with rust, worn almost paper-thin, but he knew it for what it was—a spur-rowel, unmistakably Spanish with its long cruel points. And he halted, completely bewildered. No Spaniard ever reared this mound, with its undeniable marks of aboriginal workmanship. Yet how came that relic of Spanish caballeros hidden deep in the packed soil? Brill shook his head and set to work again. He knew that in the center of the mound, if it were indeed an aboriginal tomb, he would find a narrow chamber built of heavy stones, containing the bones of the chief for whom the mound had been reared and the victims sacrificed above it. And in the gathering darkness he felt his pick strike heavily against something granite-like and unyielding. Examination, by sense of feel as well as by sight, proved it to be a solid block of stone, roughly hewn. Doubtless it formed one of the ends of the deathchamber. Useless to try to shatter it. Brill chipped and pecked about it, scrapping the dirt and pebbles away from the corners until he felt that wrenching it out would be but a matter of sinking the pick-point underneath and levering it out. But now he was suddenly aware that darkness had come on. In the young moon objects were dim and shadowy. His mustang nickered in the corral whence came the comfortable crunch of tired beasts’ jaws on corn. A whippoorwill called eerily from the dark shadows of the narrow winding creek. Brill straightened reluctantly. Better get a lantern and continue his explorations by its light. He felt in his pocket with some idea of wrenching out the stone and exploring the cavity by the aid of matches. Then he stiffened. Was it. imagination that he heard a faint sinister rustling, which seemed to come from behind the blocking stone? Snakes! Doubtless they had holes somewhere about the base of the mound and there might be a dozen big diamond-backed rattlers coiled up in that cave-like interior waiting for him to put his hand among them. He shivered slightly at the thought and backed away out of the excavation he had made. It wouldn’t do to go poking about blindly into holes. And for the past few minutes, he realized, he had been aware of a faint foul odor exuding from interstices about the blocking stone—though he admitted that the smell suggested reptiles no more than it did any other menacing scent. It had a charnel-house reek about it—gases formed in the chamber of death, no doubt, and dangerous to the living. Steve laid down his pick and returned to the house, impatient of the necessary delay. Entering the dark building, he struck a. match and located his kerosene lantern hanging on its nail on the wall. Shaking it, he satisfied himself that it was nearly full of coal oil, and lighted it. Then he fared forth again, for his eagerness would not allow him to pause long enough for a bite of food. The mere opening of the mound intrigued him, as it must always intrigue a man of imagination, and the discovery of the Spanish spur had whetted his curiosity. He hurried from his shack, the swinging lantern casting long distorted shadows ahead of him and behind. He chuckled as he visualized Lopez’s thoughts and actions when he learned, on the morrow, that the forbidden mound had been pried into. A good thing he opened it that evening, Brill reflected; Lopez might even have tried to prevent him meddling with it, had he known. In the dreamy hush of the summer night, Brill reached the mound—lifted his lantern—swore bewilderedly. The lantern revealed his excavations, his tools lying carelessly where he had dropped them—and a black gaping aperture! The great blocking stone lay in the bottom of the excavation he had made, as if thrust carelessly aside. Warily he thrust the lantern forward and peered into the small cave-like chamber, expecting to see he knew not what. Nothing met his eyes except the bare rock sides of a long narrow cell, large enough to receive a man’s body, which had apparently been built up of roughly hewn square-cut stones, cunningly and strongly joined together. Savagely he extinguished the lantern and glared across the shallow, brush- grown valley. And as he looked he stiffened. Over the corner of the hill, on the other side of which the shack of Lope z stood, a shadow moved. The slender moon was setting, the light dim and the play of the shadows baffling. But Steve’s eyes were sharpened by the sun and winds of the wastelands, and he knew that it was some two-legged creature that was disappearing over the low shoulder of the mesquite-grown hill. Brill swallowed, wondering why a peculiar trembling had suddenly taken hold of him. What was there unusual about a thieving old greaser running home with his loot? Brill tried to drown the feeling that there was something peculiar about the gait of the dim shadow, which gad seemed to move at a sort of slinking lope. There, must have been need for swiftness when stocky old Juan Lopez elected to travel at such a strange pace. Brill, as he meditated thus, was striding down the gentle slope of the pasture which led down to the creek bed. He passed into the shadows of the trees and dense underbrush and walked across the dry creek bed, noting absently that neither whippoorwill nor hoot-owl called in the darkness. There was a waiting, listening tenseness in the night that he did not like. The shadows in the creek bed seemed too thick, too breathless. He wished he had not blown out the lantern, which he still carried, and was glad he had brought the pick, gripped like a battle-ax in his right hand. He had an impulse to whistle, just to break the silence, then swore and dismissed the thought. Yet he was glad when he clambered up the low opposite bank and emerged into the starlight. He walked up the slope and onto the hill, and looked down on the mesquite flat wherein stood Lopezs squalid hut. A light showed at the one window. He staggered as from a physical impact as a frightful scream knifed the stillness. He wanted to clap his hands over his ears to shut out the horror of that cry, which rose unbearably and then broke in an abhorrent gurgle. Even as he gasped the words he was running down the hill as fast as his long legs could carry him. Some unspeakable horror was taking place in that lonely hut, but he was going to investigate if it meant facing the Devil himself. He tightened his grip on his pick-handle as he ran. Wandering prowlers, murdering old Lopez for the loot he had taken from the mound, Steve thought, and forgot his wrath. It would go hard for anyone he found molesting the old scoundrel, thief though he might be. He hit the flat, running hard.. And then the light in the but went out and Steve staggeed in full flight, bringing up against a mesquite tree with an impact that jolted a grunt out of him and tore his hands on the thorns. Rebounding with a sobbed curse, he rushed for the shack, nerving himself for what he might see—his hair still standing on end at what he had already seen. Brill tried the one door of the but and found it bolted. He shouted to Lopez and received no answer. Yet utter silence did not reign. From within came a curious muffled worrying sound that ceased as Brill swung his pick crashing against the door. The flimsy portal splintered and Brill leaped into, the dark hut, eyes blazing, pick swung high for a desperate onslaught. But no, sound ruffled the grisly silence, and in the darkness nothing stirred, though Brill’s chaotic imagination peopled the shadowed corners of the but with shapes of horror. With a hand damp with perspiration he found a match and struck it. Besides himself only Lopez occupied the hut—old Lopez, stark dead on the dirt floor, arms spread wide like a crucifix, mouth sagging open in a semblance of idiocy, eyes wide and staring with a horror Brill found intolerable. The one window gaped open, showing the method of the slayer’s exit —possibly his entrance as well. Brill went to that window and gazed out warily. He saw only the sloping hillside on one hand and the mesquite flat on the other. He starred—was that a hint of movement among the stunted shadows of the mesquites and chaparral—or had he but imagined he glimpsed a dim loping figure among the trees? He turned back, as the match burned down to his fingers. He lit the old coal-oil lamp on the rude table, cursing as he burned his hand. The globe of the lamp was very hot, as if it had been burning for hours. Reluctantly he turned to the corpse on the floor. Whatever sort of death had come to Lopez, it had been horrible, but Brill, gingerly examining the dead man, found no wound—no mark of knife or bludgeon on him. Wait. There was a thin smear of blood on Brill’s questing hand. Searching, he found thesource—three or four tiny punctures in Lopezs throat, from which blood had oozed sluggishly. At first he thought they had been inflicted with a stiletto—a thin round edgeless dagger then he shook his head. He had seen stiletto wounds—he had the scar of one on his own body. These wounds more resembled the bite of some animal—they looked like the marks of pointed fangs. Yet Brill did not believe they were deep enough to have caused death, nor had much blood flowed from them. A belief, abhorrent with grisly speculations, rose up in the dark corners of his mind—that Lopez had died of fright and that the wounds had been inflicted either simultaneously—with his death, or an instant afterward.